For the past five years, the Maui community has come together on the Friday before Memorial Day to participate in a lei-making event in order to make more than 2,846 lei for all the veterans’ graves at Maui Veterans Cemetery in Makawao. This year the event will take place on Friday, May 25, from 9am – noon on the front lawn of the Kalana O Maui (County) Building in Wailuku. Korean War Veteran Warren Nishida (right) salutes 2017 Blossoms event accomplishments by volunteers (right). The free event is co-hosted by Kaunoa Senior Services, a division of the Maui County Department of Housing and Human Concerns, and the Office of Mayor Alan Arakawa. 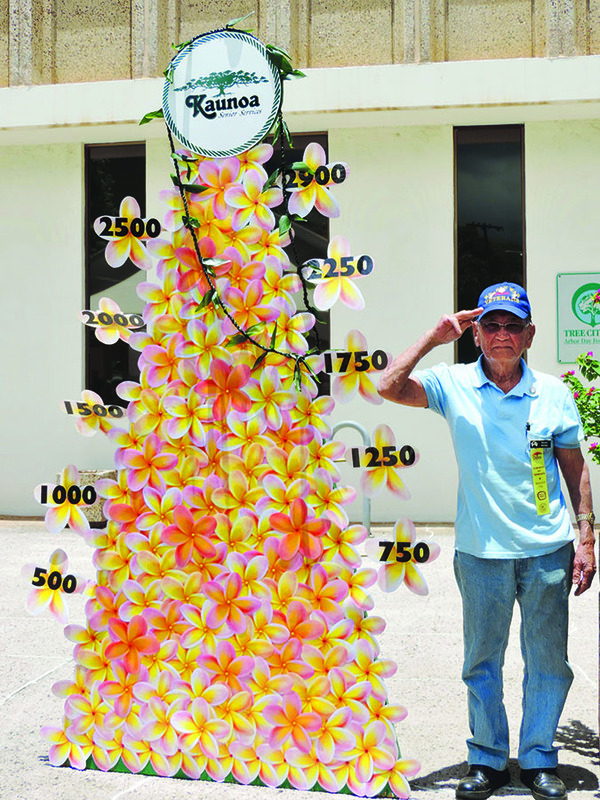 It will feature live entertainment, ti leaf lei-making instruction, and the opportunity to contribute to a noble cause. Kaunoa spearheads the event to remind the community and educate youth that Memorial Day is a time to honor and reflect upon the sacrifices made by Americans in combat, a solemn occasion marked by ceremony and prayer. Numerous community partners help assure a successful event, including the Maui Korean War Veterans, AARP Hawaii, Kihei Youth Center, and Hale Makua residents, staff and volunteers. Also vital to the realization of the greater goal are Kaunoa’s own program participants at the Congregate Nutrition Centers and Leisure/Wellness programs throughout Maui County, including West Maui Senior Center, Hana, Lāna‘i, and Moloka‘i. Homebound seniors in Kaunoa’s Meals on Wheels and Assisted Transportation programs are encouraged to participate by contributing flowers from their yards and gardens, giving them a sense of pride and keeping them connected to community. 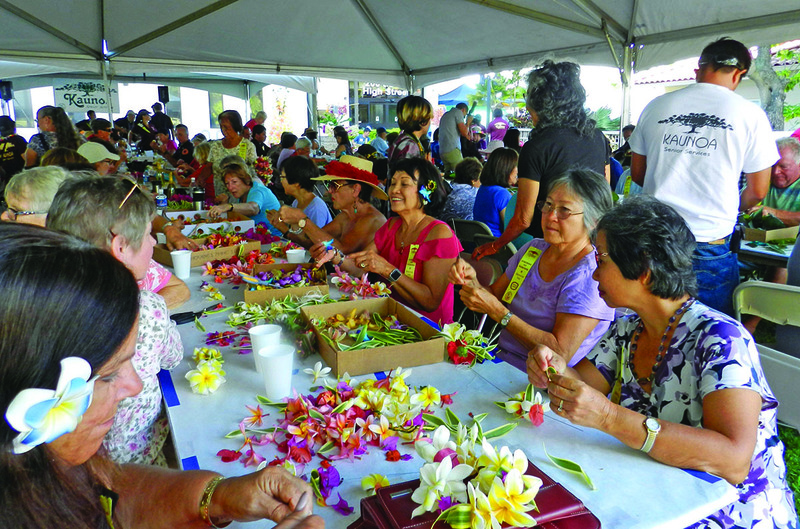 Volunteers with the Retired & Senior Volunteer Program (RSVP) help in every aspect of this major undertaking, from planning logistics and teaching lei-making classes in advance of the event, to the flower donation awareness campaign and publicity, to collection and preparation of flowers, greenery, and ti leaves on event day. Parking and a free shuttle to the County Building will be available from the Ichiro “Iron” Maehara Baseball Stadium parking lot. ◆ How May We Help You?